This tomato sauce is rich with a unique flavor. The sauce simmers for about an hour, during which time I made Meatballs  and boiled spaghetti. Finely chop the onion and garlic and set aside. Heat oil in a large stock pot over medium heat. Add onion and garlic and saute for 3 to 4 minutes. Empty tomato cans, juice included, into a large mixing bowl. Crush tomatoes with hands. Add tomatoes to the onions and garlic in the stock pot. Add tomato paste, water, parsley, oregano, sugar, and salt. Bring sauce to a boil, then reduce heat to a simmer. Cover partially to allow steam to escape. Simmer for approximately 1 hour. 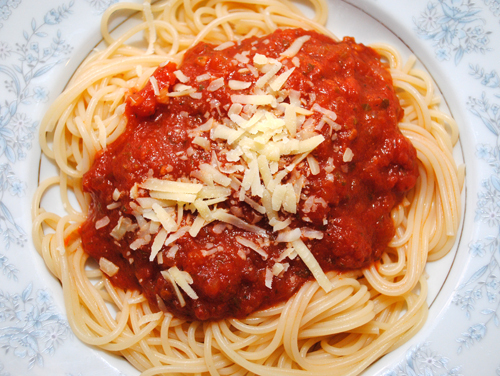 Use sauce in a variety of recipes, including pasta and Meatballs , sprinkle with Parmesan cheese if desired. Sauce will keep in the refrigerator for several days and can be frozen for future use.